The sessions were led by staff from the Environment Agency, which provides Hull with flood warnings and alerts when the risk of flooding from rivers and the Humber Estuary is high. Over the years the city has been affected by numerous significant river and coastal flood events and on 25 June, 2007, Hull City Council reported more than 9,000 homes and businesses were flooded when heavy rains covered the city. 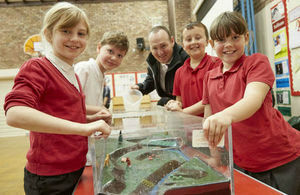 The floods resulting from this caused many millions of pounds of damage and 95 of the city’s 98 schools were closed. We’re very grateful to the Environment Agency for coming to see us. The children thought it was great fun and it taught them valuable lessons that they’ll hopefully pass onto their parents. Thankfully ours was one of the luckier schools to have escaped the floods of 2007, however, we couldn’t overlook the damage it caused. We believe it is important for our students to fully appreciate their environment and understand that nature has the potential to be both beautiful and dangerous. Through government funding and partnership contributions, the Environment Agency is investing more than £200million in Hull and the East Riding of Yorkshire to help reduce the likelihood of flooding for thousands of properties by 2021. Part of this investment includes £35.5million of remedial works on the River Hull’s flood defences, which will see the repair and replacement of 39 sections of river defence identified as being at the greatest risk of failure. Over the years we have seen how destructive flooding in Hull can be. While we are investing a lot into the city, much of the devastation caused by flooding can be prevented by making sure people are prepared. We’re working closely with schools in the area as we believe the next generation will be key to making Hull one of the world’s most flood resilient cities and we have loved the enthusiasm shown by the students of Stoneferry Primary School. Work on the River Hull Defences Scheme started in April this year and is being delivered by contractor BMM JV – a joint venture between BAM Nuttall and Mott MacDonald. Varying levels of improvements to the River Hull defences are needed across the sites and work at different locations across the city is likely to progress at the same time. While we are progressing the work along the river as smoothly and efficiently as we can, due to limited access at some of the sites, traffic from some roads and public pathways may need to be re-directed for short periods of time. Any road closures will not happen until the New Year and we are doing our utmost to reduce the level of inconvenience caused to the public. A quarter of the total length of works is now complete, and the Environment Agency expects a substantial amount of the work to be underway by the end of the year. If you are a teacher who is interested in working with the Environment Agency, please email york.flood@environment-agency.gov.uk. To learn more about the effects of flooding and to find out where you can sign up to Flood Warnings, please visit: floodsdestroy.campaign.gov.uk.